We’ve always maintained that chocolate and tea is a match made in heaven, so we were delighted when Chococo asked Devonshire Tea to be the very first Devon brand to collaborate with them to create a brand new flavour infusion, and to help celebrate the success of their Exeter Chocolate House. After lots of planning and development by their chocolatiers, the Elegant Earl Grey chocolate was born. A delightfully fragrant creation, these inspired chocolates are created by infusing real Earl Grey loose leaf tea with fresh Dorset cream and a Venezuelan-origin 43% milk chocolate ganache. This delicate filling is then piped into a Madagascan 67% dark chocolate shell. Subtle and sophisticated — serious chocolate! Since we had so much fun collaborating on these wonderful chocolates, we popped into Chococo’s Exeter Chocolate House on Gandy Street to meet with founder and chocolate aficionado, Claire Burnet. We chatted over steaming mugs of Madagascan hot chocolate (well, it can’t always be tea! ), and discussed everything from the wonders of cocoa beans and the differences with real chocolate, to the importance of South West businesses supporting each other. When did you establish Chococo and what inspired you to do so? I established Chococo back in 2002 with my husband Andy. We were inspired by the fact that no-one was making truly fresh chocolates using local ingredients or origin chocolate at that time in the UK. The inspiration came from the chocolate experiences I had on the continent back in the late 1980s, when my parents lived in Brussels and Holland where we used to visit artisan chocolatiers making truly fresh chocolates on their premises. I wanted to recreate this connection with fine, fresh chocolate when setting up Chococo. Why did you choose Exeter as the location for your third shop? Exeter is a fantastic vibrant city with a buzzing local food culture and a number of thriving independent businesses. It’s also close enough for us to supply our chocolate house on Gandy Street from our chocolate kitchen in Wareham, in Dorset. When we saw the unit on Gandy Street, we knew it would make a perfect location for our third chocolate house; as there is space for both our chocolate shop and for seating. We pictured our customers sitting back and enjoying our origin hot chocolates, locally roasted Crankhouse coffees and Devonshire Tea all in one spot. How would you describe a Chococo customer? We appeal to customers of all ages. 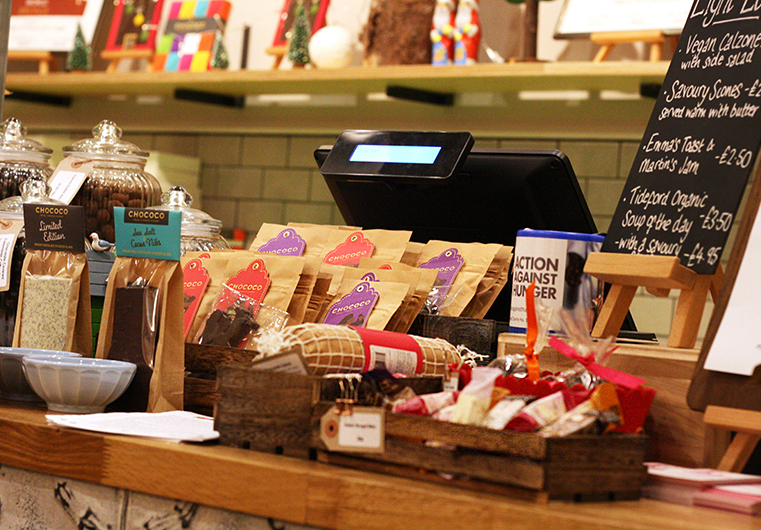 Chococo is a shop for anyone who appreciates fine chocolate and spending quality time with their friends and family. Why is it important for you to work with local businesses such as ourselves? Working with local suppliers has been part of our DNA since we set up Chococo back in 2002 and we have built strong relationships with other food producers over the years. For example, we have worked with Trevor Craig of Craig’s Farm Dairy based just outside Weymouth (suppliers of all Chococo’s fresh cream since day one). We love to support local producers because together we can help support the local economy and spread the word about the amazing food and drink that is being produced in Dorset, Hampshire and Devon. Collaboration also allows us to create chocolates with unusual local ingredients - and believe me, we’ve done just that. Blue Vinny cheese, fresh wasabi, watercress & Black Cow vodka are all ingredients that have all made their way into our products in one way or another. We love the challenge of creating new and innovative chocolates. We also love to champion local food and drink producers in our cafés too. The coffee our customers enjoy in our Exeter chocolate house is slightly different to that served in our Swanage or Winchester houses. In Exeter, we work with Crankhouse Coffee, roasted in Exeter, and in Winchester we work with Moonroast Coffee. This also applies to our tea suppliers, so naturally our Exeter customers enjoy a cup of Devonshire Tea. Can you give us an example of how you’ve worked with another local producer? Would you believe we’ve used watercress in one of our chocolates? We ran a competition in our Winchester chocolate house where we asked our customers to suggest a chocolate with local flavours that would capture the essence of Hampshire. The final result was our Totally Twisted Nose chocolate, which is a blend of fresh Dorset cream infused with fresh watercress from the Watercress company (Dorset and Hampshire), origin white chocolate, and Twisted Nose Gin. This unique gin is crafted by Paul Bowler of the Winchester Distillery and one of the botanicals he uses is watercress, so this totally bonkers chocolate is a real taste of Hampshire! It is also quite delicious and won a Gold Academy of Chocolate Award in 2015. To celebrate our partnership with Chococo, we have teamed up to offer a delicious prize of a box of their Elegant Earl Grey chocolates and a set of 4 boxes of Devonshire Tea: Earl Grey, Classic Breakfast, Delightful Afternoon and Assam Origin. Visit the competition page over on the Chococo website to enter — good luck!